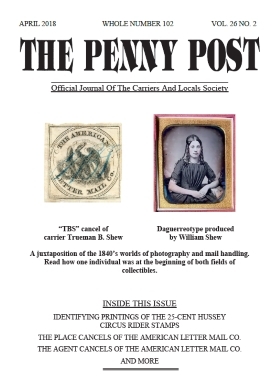 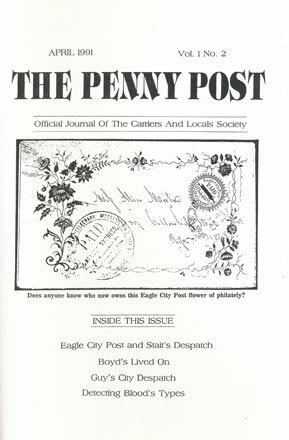 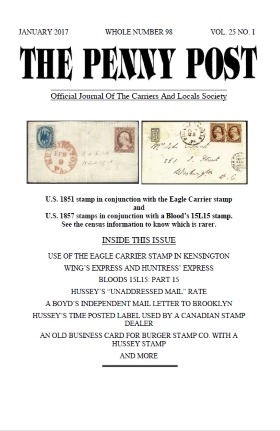 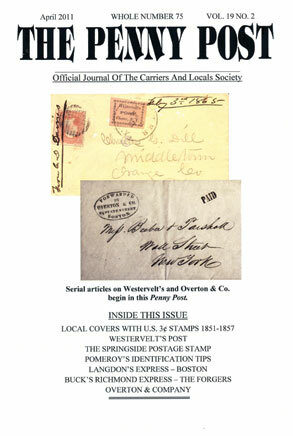 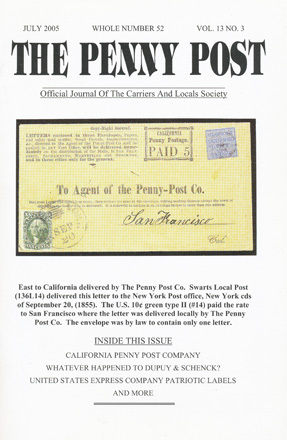 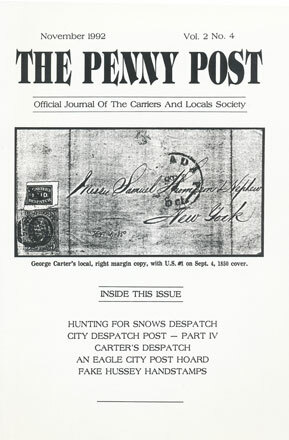 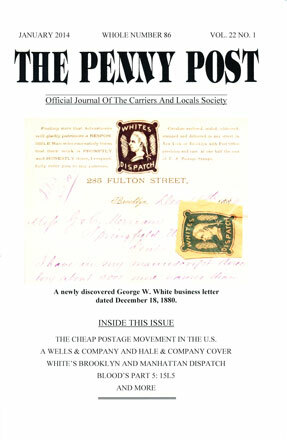 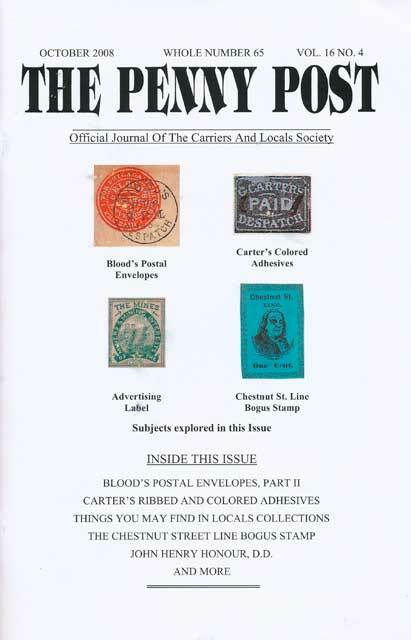 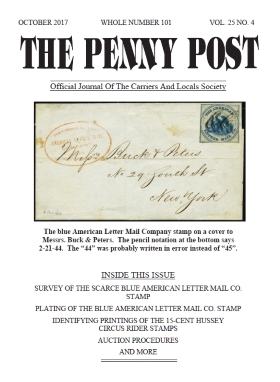 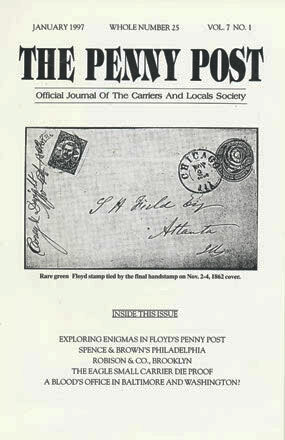 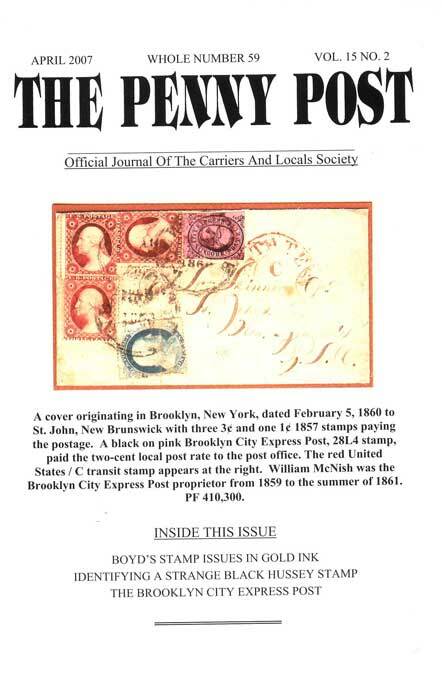 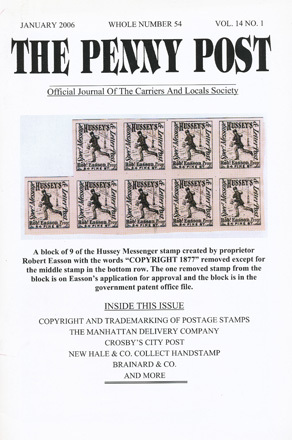 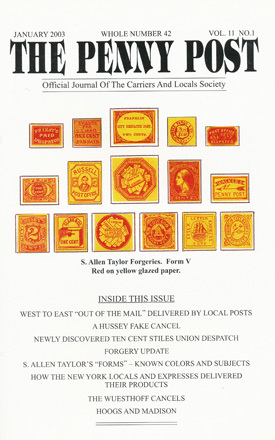 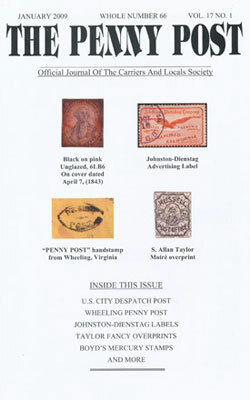 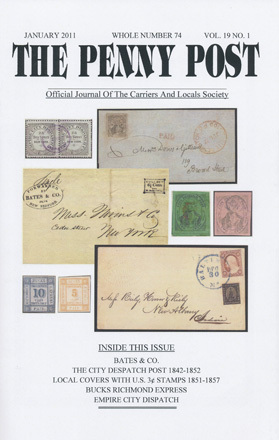 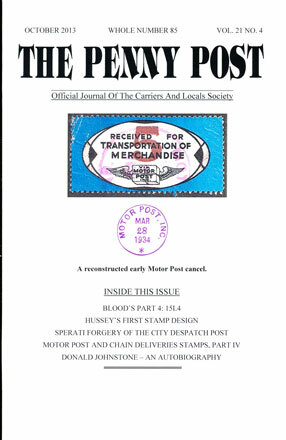 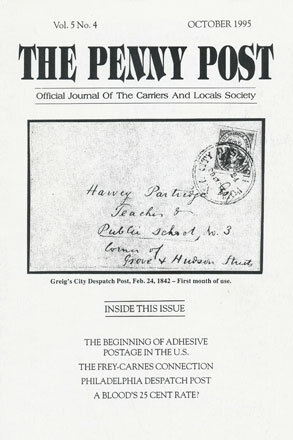 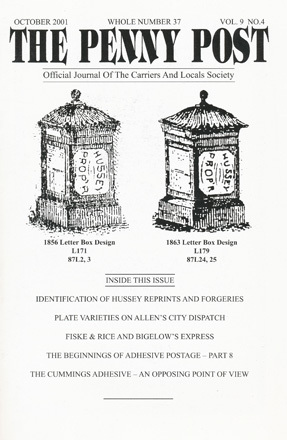 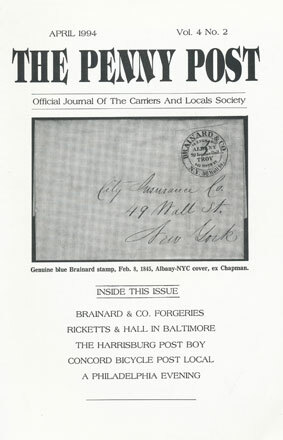 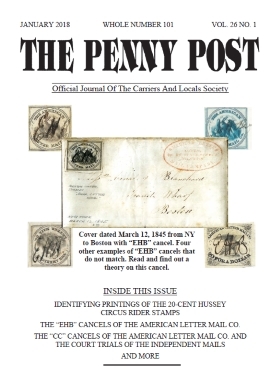 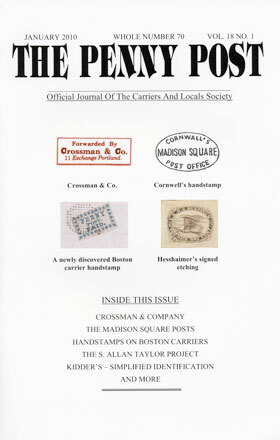 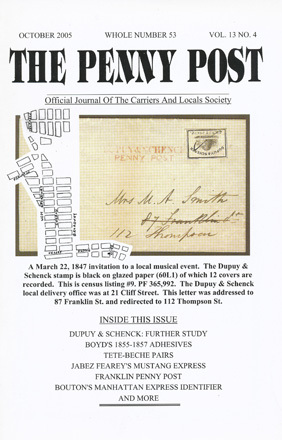 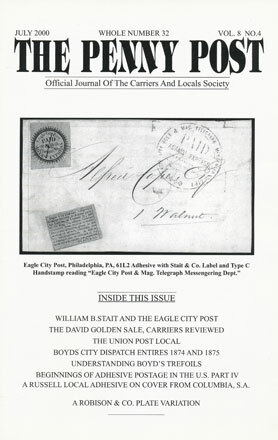 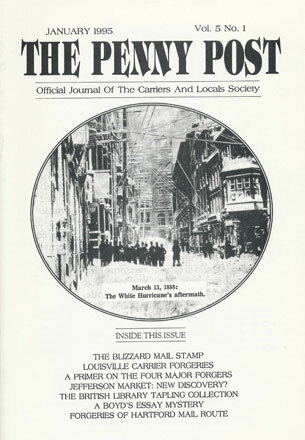 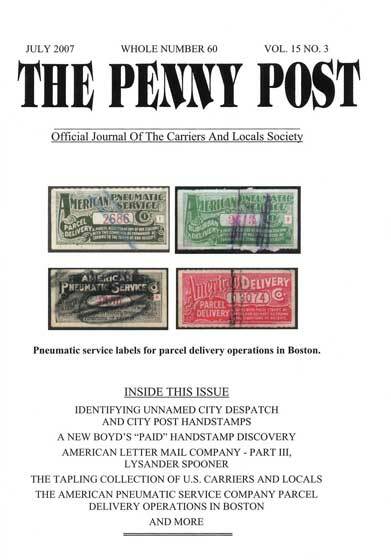 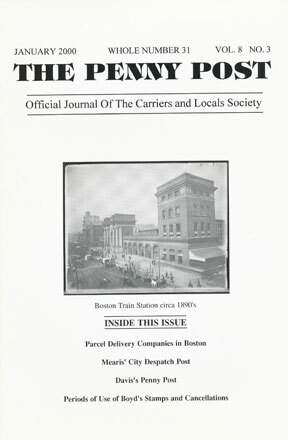 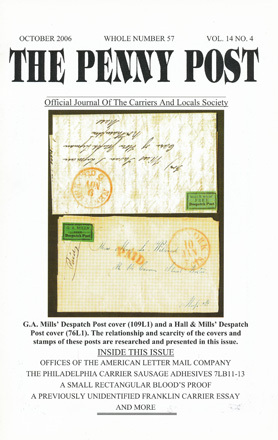 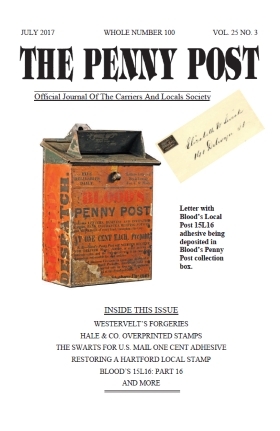 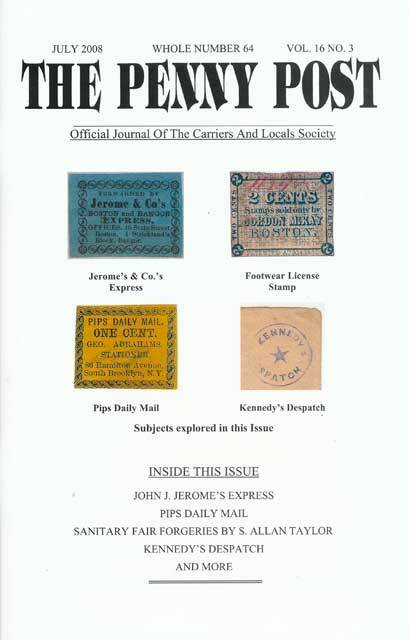 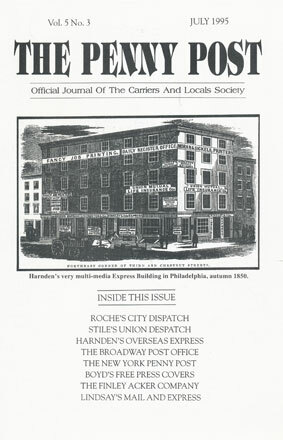 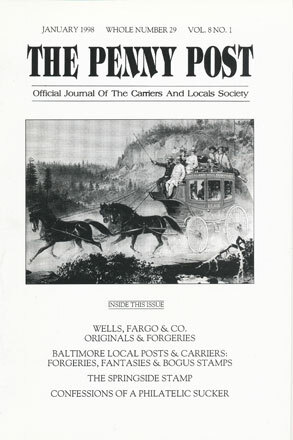 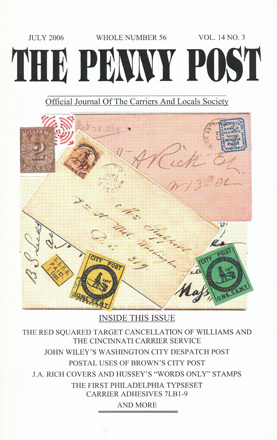 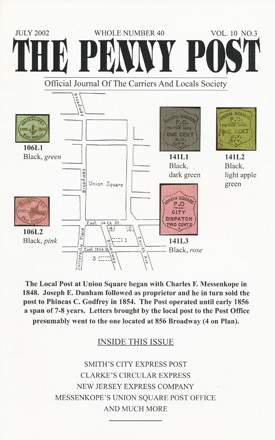 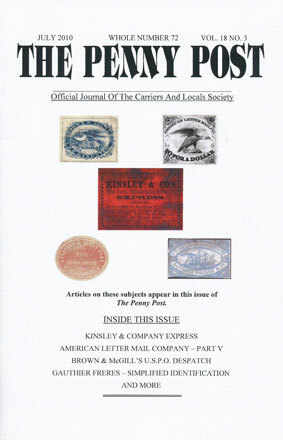 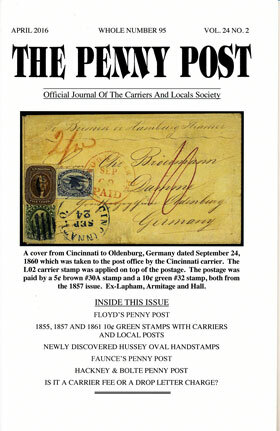 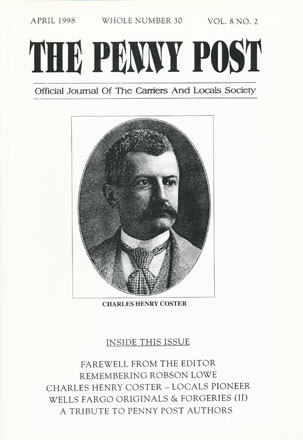 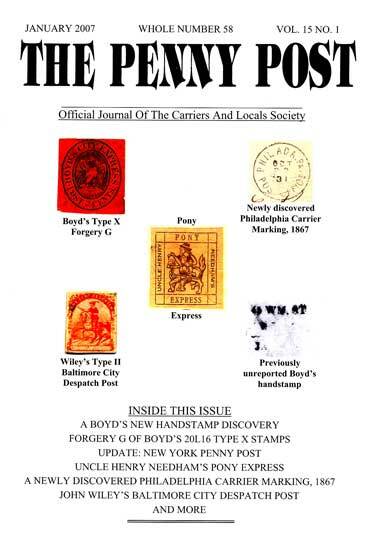 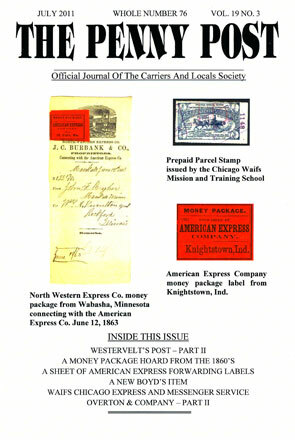 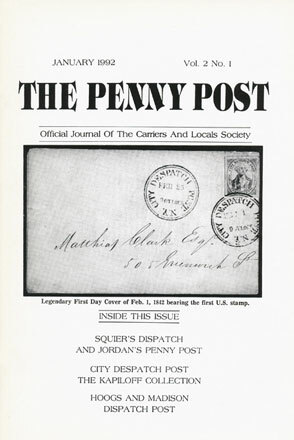 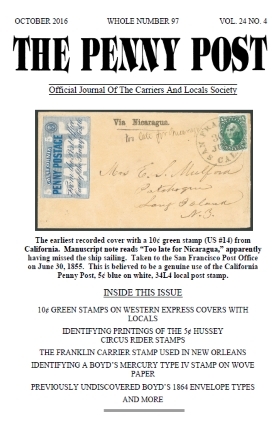 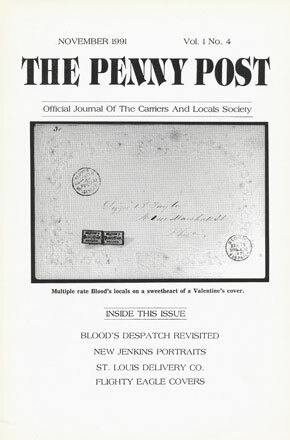 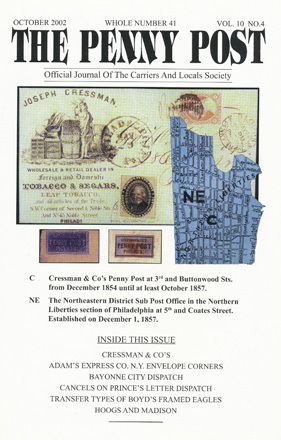 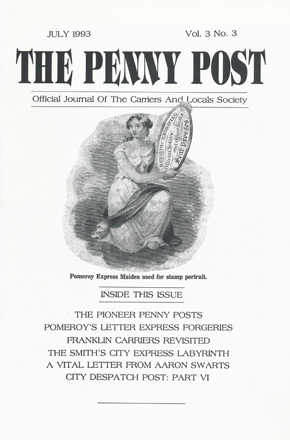 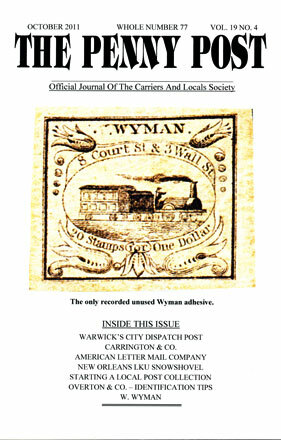 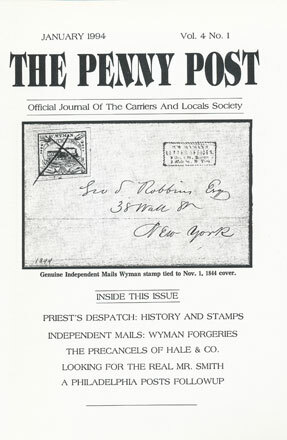 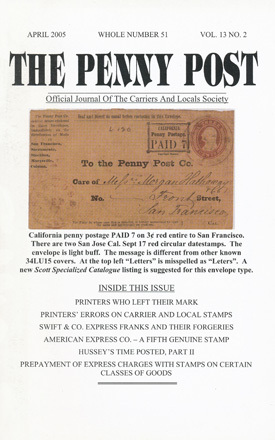 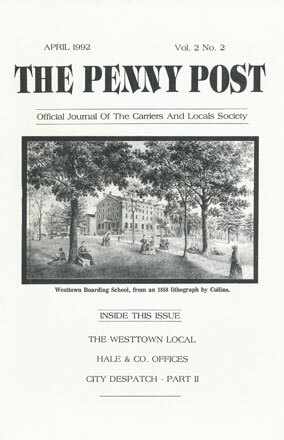 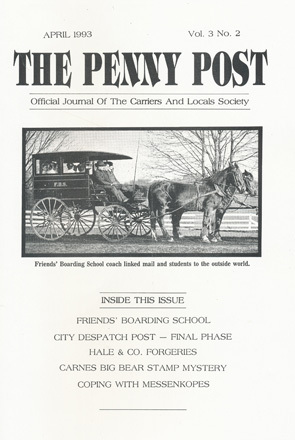 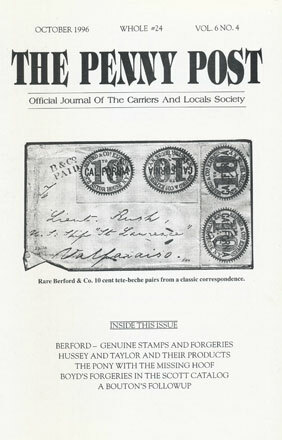 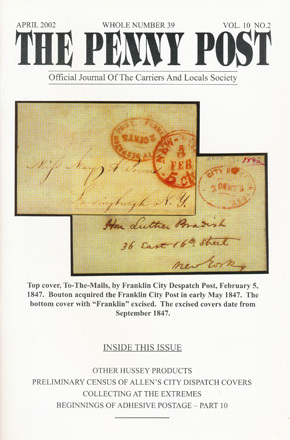 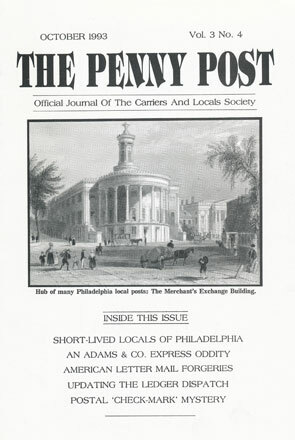 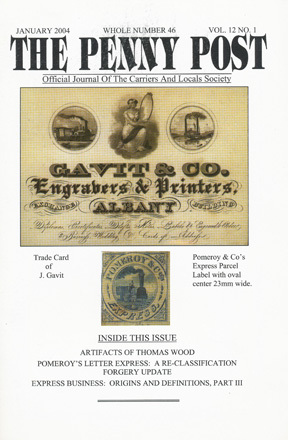 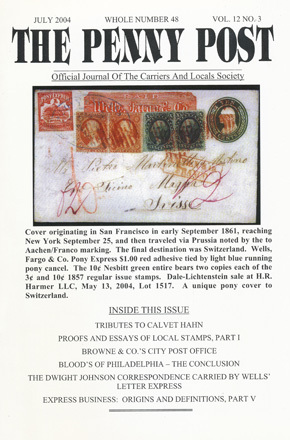 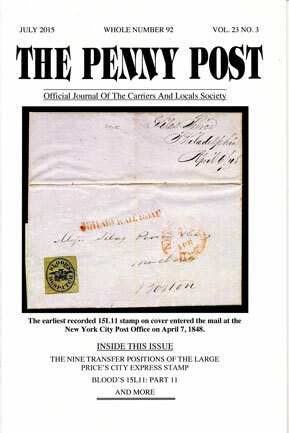 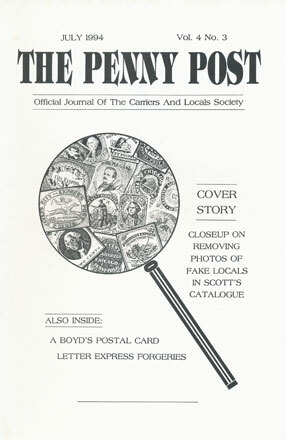 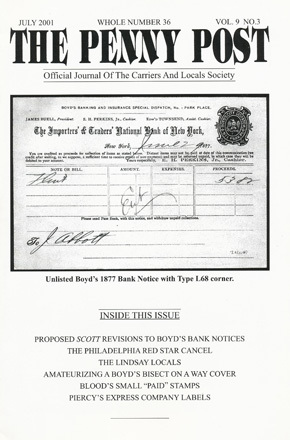 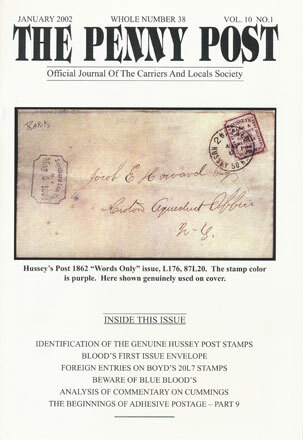 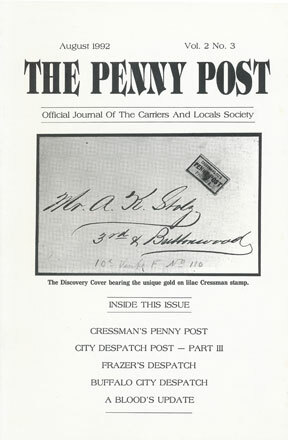 Front covers and tables of contents for all available issues of The Penny Post are listed below. 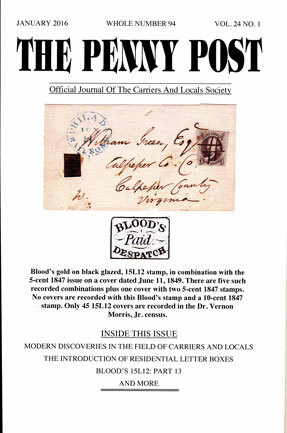 Bloods 15L15: Part 15 by Vernon Morris, Jr. 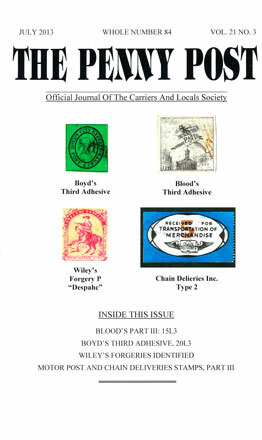 Blood's 15L16: Part 16 by Vernon R. Morris, Jr.
Blood’s 15L13; Part 14 by Vernon R. Morris, Jr. 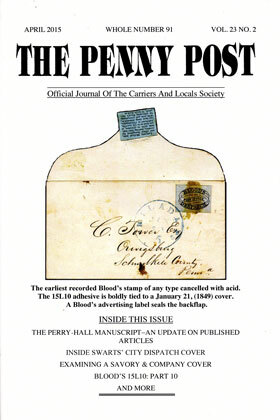 Bloods Part 7: 15L7 by Vernon Morris, Jr. M.D. 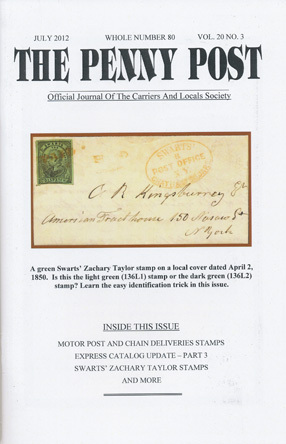 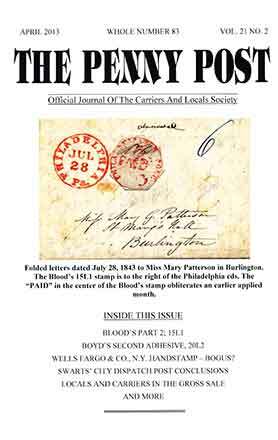 Bloods Part 8: 15L8 by Vernon R. Morris, Jr., M.D. 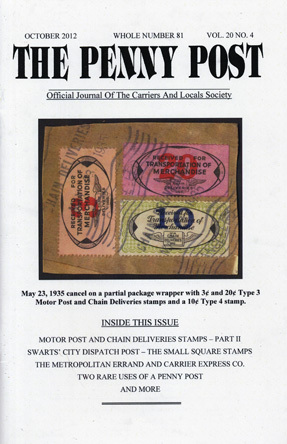 Bloods Part 3: 15L3 by Vernon Morris, Jr. M.D. 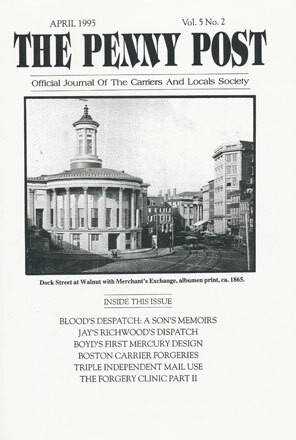 Bloods Part 4: 15L4 by Vernon R. Morris, Jr., M.D. 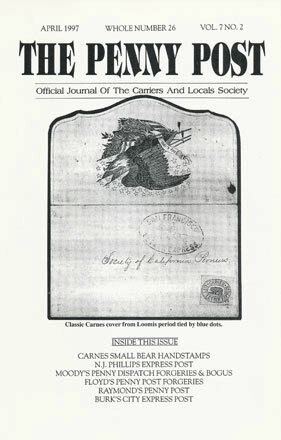 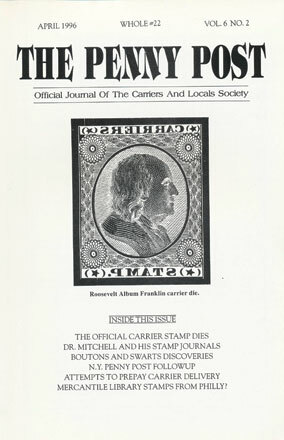 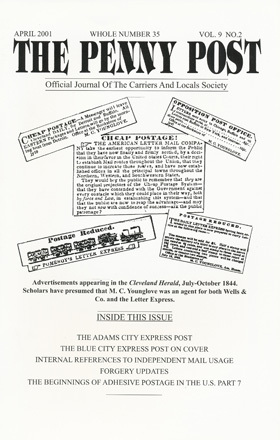 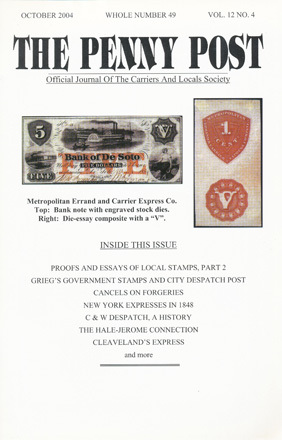 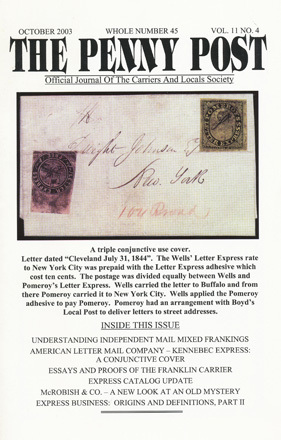 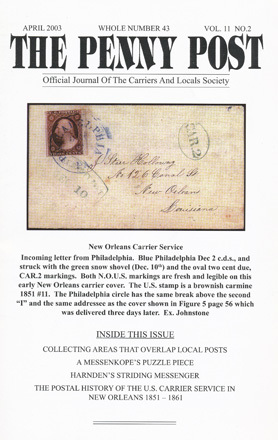 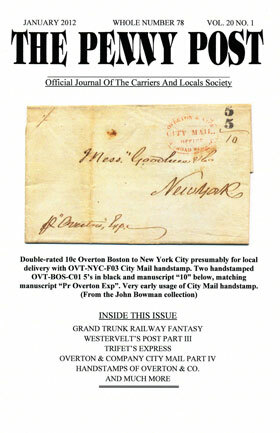 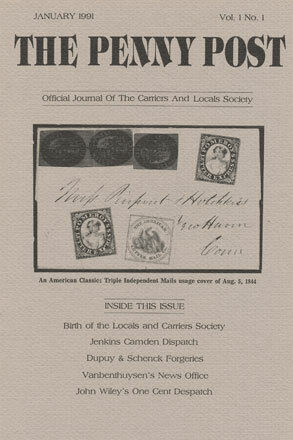 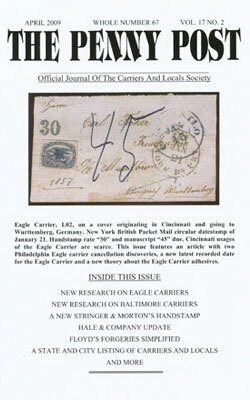 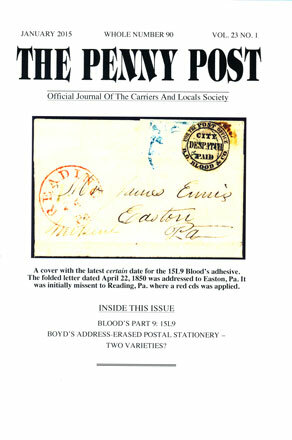 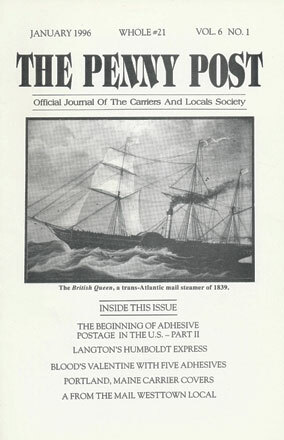 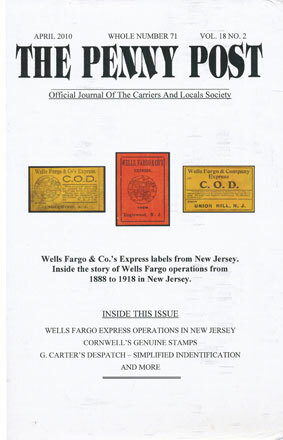 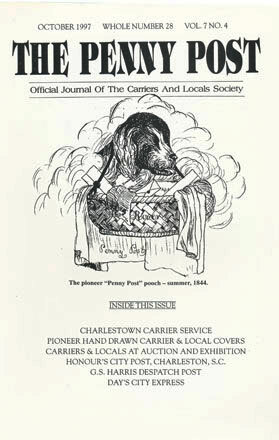 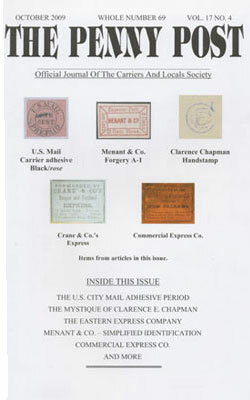 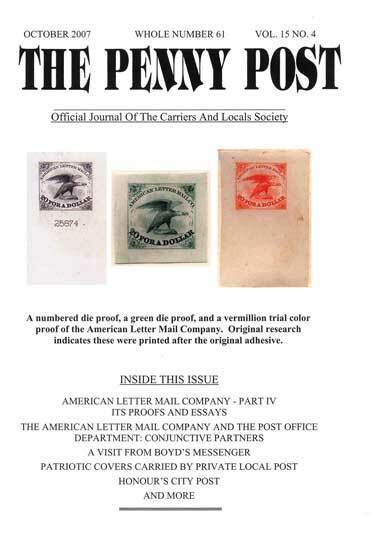 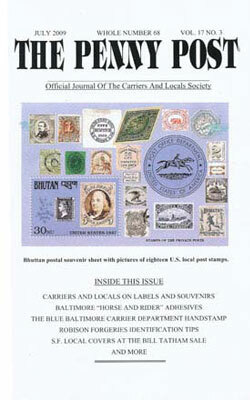 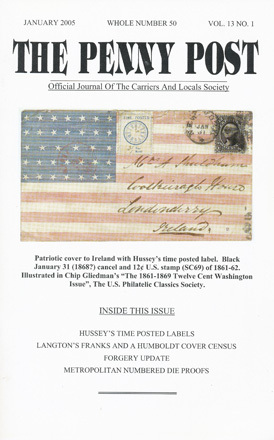 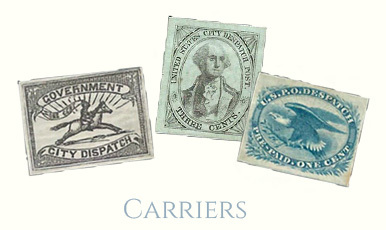 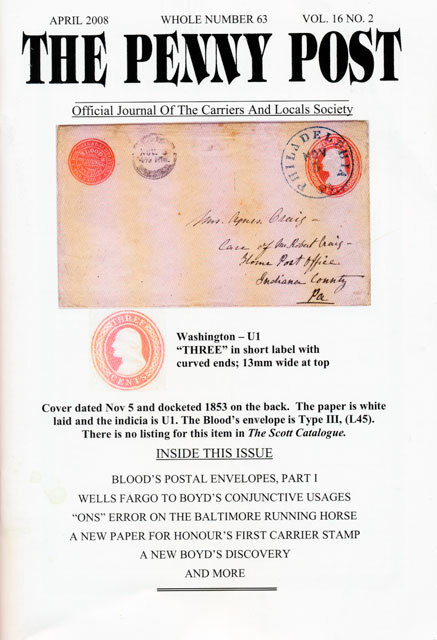 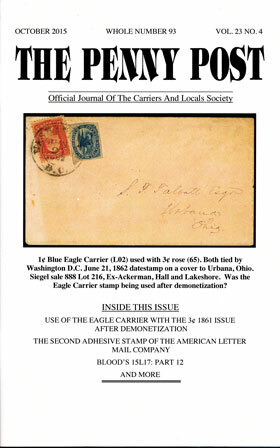 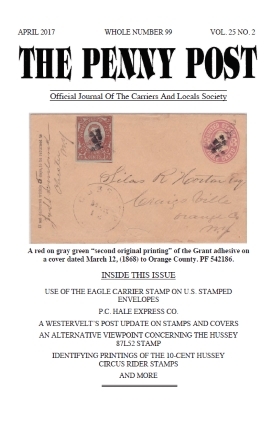 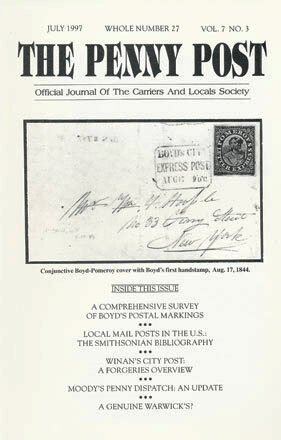 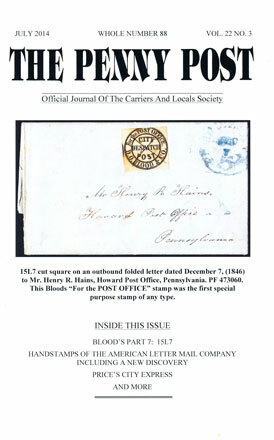 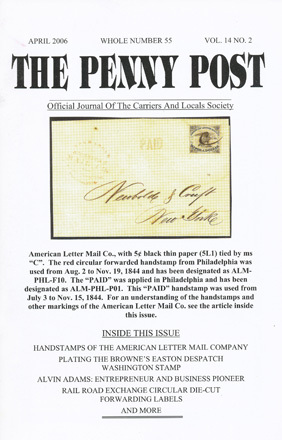 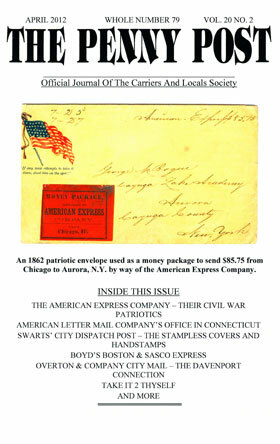 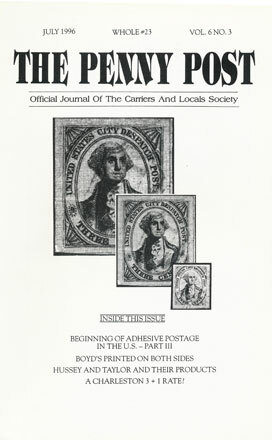 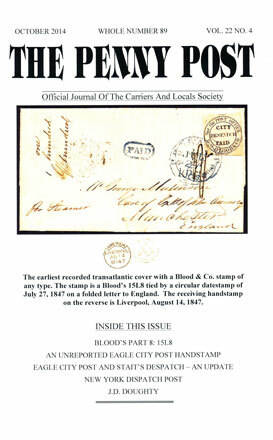 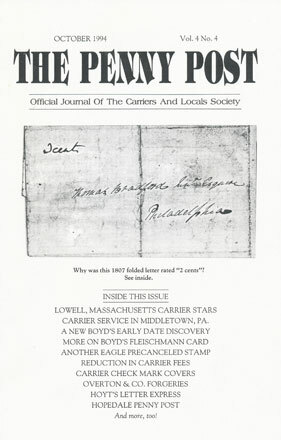 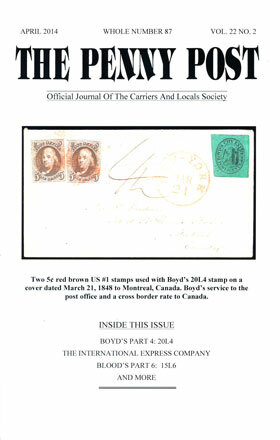 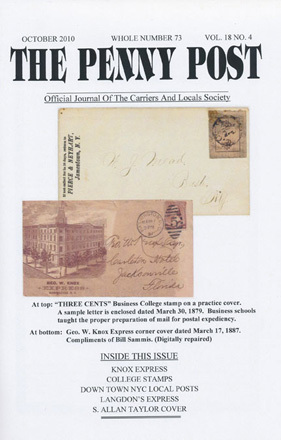 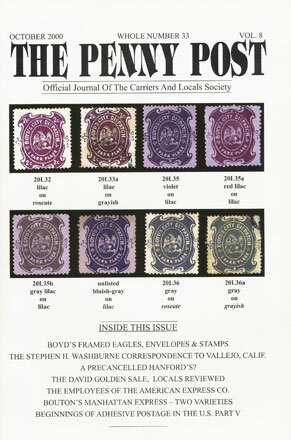 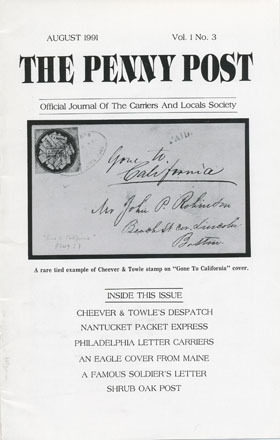 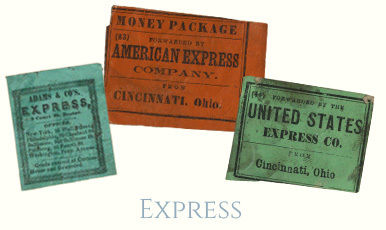 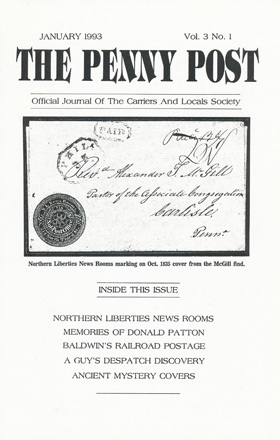 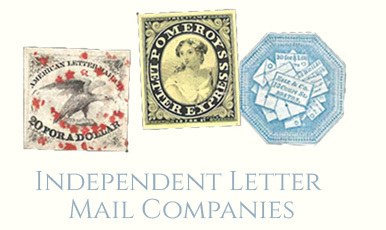 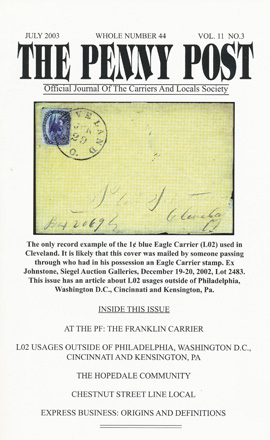 America’s First Carrier Service, The U.S.
Blood’s 15L12 Small "PAID" by Vernon Morris, Jr. 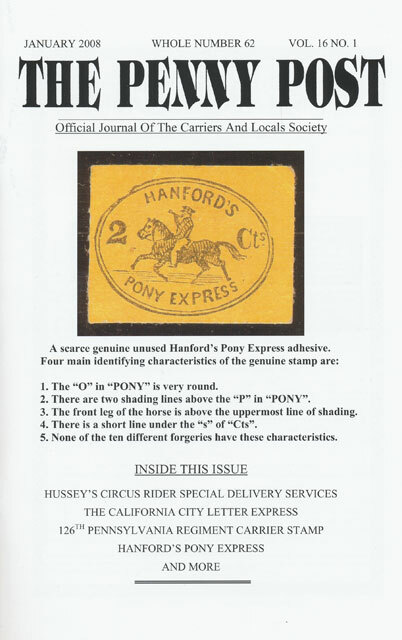 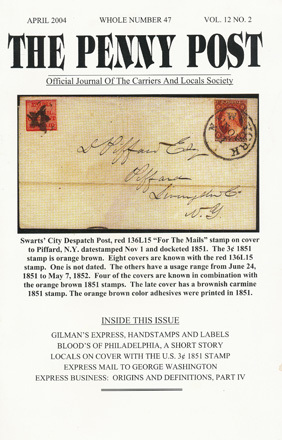 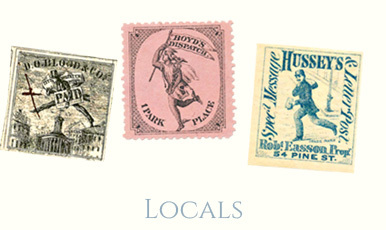 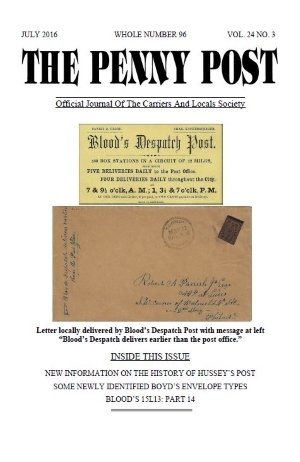 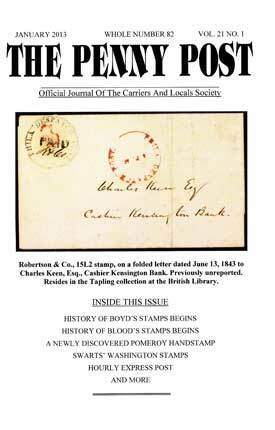 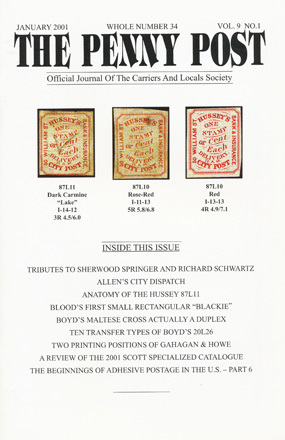 Recollections of Blood’s Dwespatch Post by W. Otis Blood, Sr.
Shrub Oak Post by Herman Herst, Jr.